I’m partial to freshly baked bread. If I had it my way, I would have it at every meal. The smell, the chew, the texture, is so satisfying in a way that the shelf-stable kind can’t replicate. So, after you’ve put in all that trouble and time, longing over some homemade bread, the last thing you want to happen is that it doesn’t turn out. Let’s go through the 5 mistakes you’re making when baking bread, and hopefully, you’ll always bake up the perfect loaf! Which mistakes do you always make when you’re baking bread? Is there a mistake we didn’t cover, or a bread making step that you find especially tricky? Sometimes the simplest solution is the best solution. Bread making is much more of a science than some other cooking, so professional bread makers recommend to always use digital scales when measuring ingredients for proper precision. While measuring cups and spoons are fine for most other baking, there can be a lot of variance in how much actually gets into a measuring cup when scooping light ingredients like flour, yeast, sugar, and salt. Exact quantities can make the difference from a dense loaf to a light, airy one. More so, make sure your yeast is still active and working. If you’ve had your yeast for a long time, or you’re just not sure if it’s still active, test it by dissolving 1/2 teaspoon of sugar into 1/2 cup of warm water. Stir in your packet of dry yeast (2 teaspoons); active yeast will bubble and froth within ten to fifteen minutes. 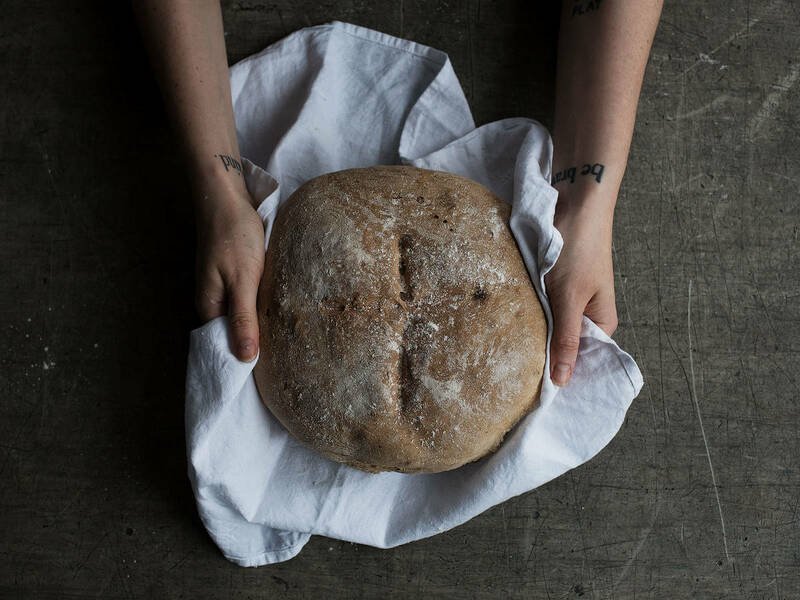 Kneading the dough is probably where most novice bread makers meet their biggest challenges. First, we knead bread dough in order for the protein molecules in the flour to form and to create gluten, the essential component that gives bread its structure. Gluten is responsible for catching the gas as the bread rises, which is the key factor for good texture. When gluten has been adequately developed for bread dough, the dough will take on several characteristics. Some bakers rely on the “window pane test” to ensure that dough is kneaded properly, in which you can stretch the dough thin enough that you can see through it. A well kneaded dough will be stretchy, elastic, and bounce back when poked. Overworked dough can happen when using a stand mixer. Dough will feel “tight” and tough, as the gluten molecules have become damaged, meaning that it won’t stretch, only break, when you try to pull or roll it. Underworked dough on the other hand, won’t form a ball shape easily. As gluten molecules haven’t developed yet, the dough flops and also tears. It hasn’t come together yet, and requires more kneading. Over kneaded dough can’t be fixed and will result in a rock-hard loaf, so be careful with this mistake. When we mix our ingredients together, some serious science starts to happen. The yeast begins eating the starch sugars in the flour and releasing those sugars in the form of carbon dioxide. Proofing is the process that allows the build-up of carbon dioxide into the dough, expanded the loaf as its bakes. Some problems occur when the dough isn’t at the right temperature or if the dough hasn’t been allowed enough time to proof—this is because the yeast isn’t able to complete its work. A warm, draft-free place is recommended for proofing as the temperature encourages the yeast’s reactions. A cold temperature will slow the reaction and a temperature that is too hot will begin the cooking process and kill the yeast. You’ll know your dough is perfectly proofed if you poke it and your finger leaves an imprint that disappears within a few seconds. The dough should feel soft and pillowy. Before we pop that bread in the oven, give it a score across the top. This is done by using a few slits of the knife on the very top of the dough, which allows the build-up of carbon dioxide from the yeast to release properly when baking. Next make sure the bread is baked through before you take it out of the oven, this usually means to an internal temperature of 90 – 100°C/190 – 210°F in the middle. If you don’t have an instant read thermometer, you can always turn your bread over and tap the bottom. A fully baked loaf will sound hollow to the tap. What you’re listening for is the sound of the water having been cooked out of the loaf. Finally, more waiting. Resist the urge to slice into that hot loaf of bread. A cooling loaf is a still cooking loaf, meaning that until the bread is cool, there is still moisture evaporating from the hot bread. When it’s cool, you should enjoy a perfectly baked loaf of bread. Bon Appetit! What’s the Difference Between Fresh, Active, and Instant Yeast?